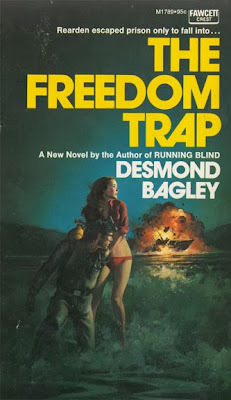 The Freedom Trap is the eighth novel published by Desmond Bagley. Its United States debut was a hardcover published by Doubleday in 1971, but it is the Fawcett Crest paperback edition that caught my eye. The cover art has everything an adventure novel should—a frogman, a bikini clad beauty, an exploding boat in the background, and the tide breaking onshore. 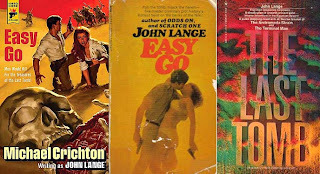 The artist, as far as I know, is unknown, but it is a fine example of a 1970s Fawcett paperback. The novel itself is pure adventure. 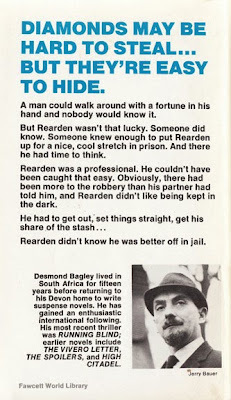 Reardon is a high class criminal who is hired by a man named Mackintosh for a simple job—knock over a postman delivering a shipment of uncut diamonds and hand them over to Mackintosh and get paid. But like everything, nothing is as simple as it seems and Reardon finds himself in prison serving 20 years. And all this in only the first 38 pages; and it astonishingly gets better. It is widely believed The Freedom Trap was inspired by Soviet spy—or more accurately British double agent—George Blake’s October 22, 1966 escape from Wormwood Scrubs prison. He was convicted of espionage and sentenced to 42 years in 1961. 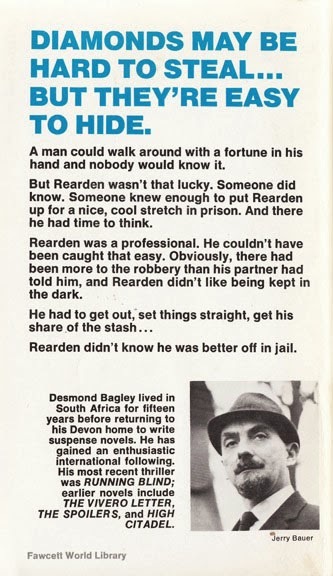 The plot is similar to Jack Higgins’ 1967 Paul Chavasse novel The Dark Side of the Street, which was also likely influenced heavily by the George Blake story (due to the timing of its release) and is an excellent adventure novel in its own right. The Freedom Trap was translated to film as “The Mackintosh Man” starring Paul Newman as Reardon. The plot, and it has been several years since I have seen it, follows the novel quite closely. It was directed by John Huston and written for the screen by Walter Hill. 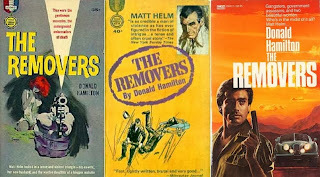 Although for all excitement, action and even history of the novel, it is the cover on that 1973 Fawcett Crest paperback (M1789) that made me pick it up in the first place. 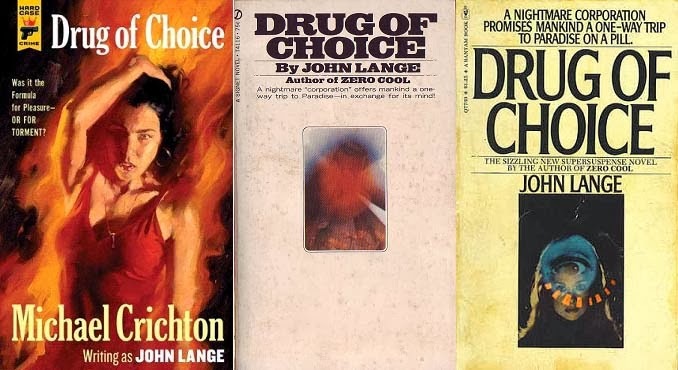 It’s a shame these lurid covers and well told stories are relics limited to thrift shops and forgotten used books stores. 2013 marked my reentry to consistent blogging, and it was also my most productive year as a reader in the past five or six. To date I have finished 53 books (and I will probably finish another 2 or 3); the majority were novels, but the total includes a tolerable number of nonfiction works, too. 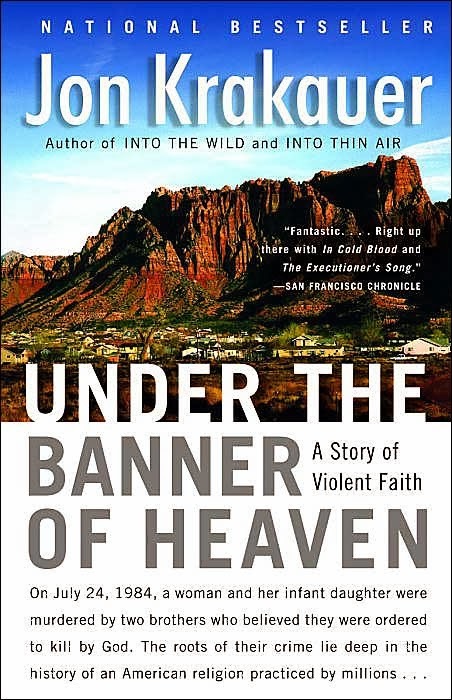 The nonfiction tended towards history, which included a number of interesting titles including Under the Banner of Heaven by Jon Krakauer and Manhunt by Peter Maas. The year also marked a return to a genre I enjoyed (loved?) as a boy—adventure. Specifically the British writers of the 1960s and 70s featuring such stars as Alistair MacLean, Desmond Bagley, and Jack Higgins. This said, I didn’t read many “new” authors, but mostly stayed with the old reliables. In fact, I only increased my fiction writers read by five—Craig Thomas (Wolfsbane), Alfred Coppel (The Eight Day of the Week), Shepard Rifkin (The Murderer Vine), A. Bertram Chandler (Star Courier), and Billie Sue Mosiman (Wireman). What I lacked in new writers I made up for in my long time favorites. A full fifteen of the novels I read, or approximately 28 percent of my total reading, was limited to four writers. I read or reread six titles by Jack Higgins, and three titles each by Jack M. Bickham, Ed Gorman, and Bill Pronzini. And I really enjoyed every one of the novels by each of my most frequently read writers of 2013. 5. 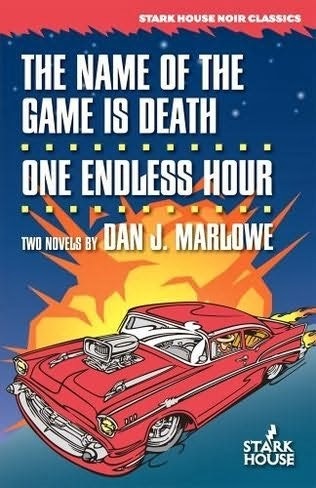 The Name of the Game is Death by Dan J. Marlowe. 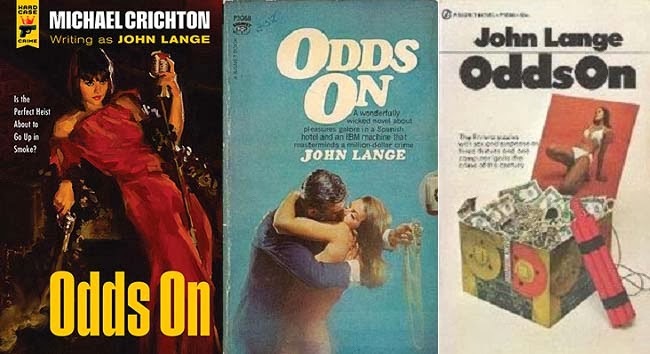 This is the first title to feature Marlowe’s recurring character Earl Drake, and it is a real piece of hardboiled candy. It was originally published by Gold Medal in 1962, and earlier this year it was released with its sister novel The Endless Hour in a nifty trade paperback by the never disappointing Stark House Press. Read the Gravetapping review. 4. Dark Passage by David Goodis. This is Goodis’ most well-known novel. It is dark, a little twisted, and a bunch of fun. It was originally published in 1946, and it has been reissued a number of times. It is currently available in an omnibus hardcover edition by The Library of America, which includes four other Goodis titles. 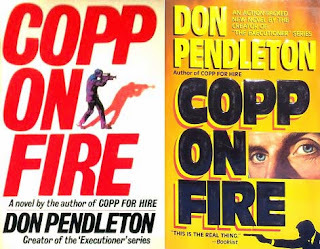 Interestingly, the plot is similar to the television show “The Fugitive” and United Artists Television settled a copyright lawsuit with Goodis’ estate. 3. 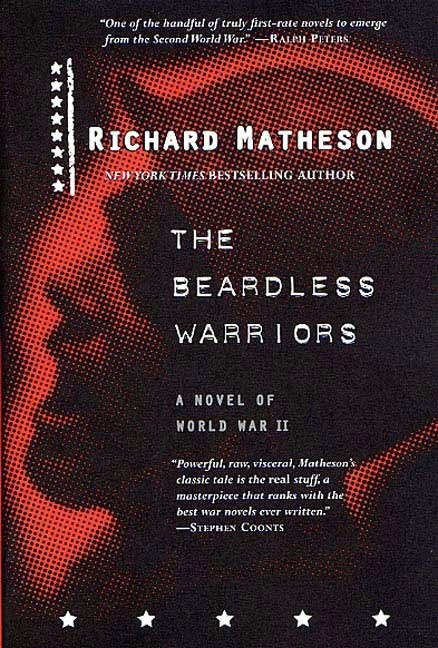 The Beardless Warriors by Richard Matheson. I was reading this title for the first time when Richard Matheson passed earlier this year, and it is a truly masterful piece of storytelling. It is the story of a young man ordered to the frontlines as a replacement soldier during the Battle of the Bulge in Europe. 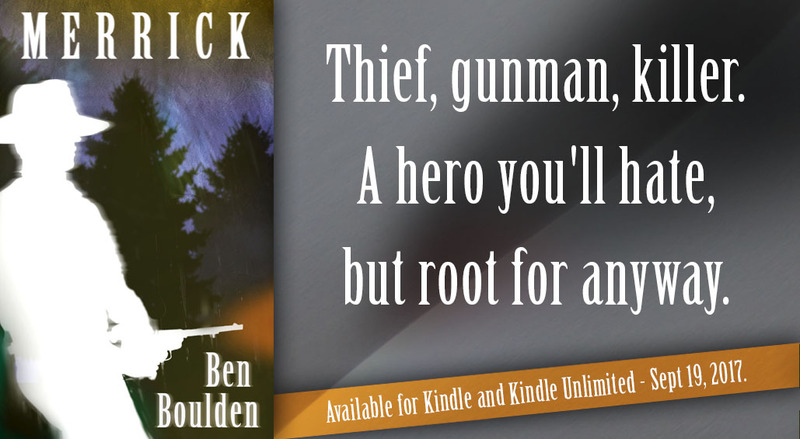 He is transformed from a green recruit to a seasoned combat soldier in a matter of days, and what frightens him and the reader alike is how easily he takes to killing. This is a masterpiece by one of the most consequential authors of his generation. 2. Fire in the Hole by Elmore Leonard. This is a collection of short stories written by Mr Leonard. The title is from the story the television series “Justified” is based, and amazingly the pilot for the television series and the story are almost identical. I devoured this collection in little more than one sitting, and as I read it my main thought—nobody writes like Elmore Leonard. 1. The Murderer Vine by Shepard Rifkin. When I sat down to compile the best of list there was no doubt what the number one would be. It is a perfectly executed crime novel, and an even better piece of civil rights literature. Read the Gravetapping review. 2008. Beijing, China. The world has descended on China for one of the most spectacular public relations campaigns in modern history. The Summer Olympics mark China’s celebration, and notice to the world, that it has arrived as a major world power, and it is of the utmost importance nothing go wrong. A small group of private foreign security agents are hired to help protect the influx of both Western athletes and tourists. The novel begins with the opening ceremonies in the behemoth stadium coined “the bird’s nest” with an unexpected and very violent operation involving both the private security firm and Chinese Special Forces. A group of what the Chinese believe to be terrorists are captured in the delivery access area of the stadium. 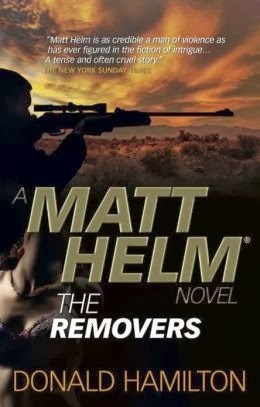 It is a quick and violent operation that isn’t noticed by anyone, including the media, but leads the protagonist, Tag McCall, into a dark and dangerous mission that will cost him more than he can fathom. Dragon Games is a throwback in the thriller racket. It is more adventure and less bombast. The writing is tight and literate, and the plot is streamlined into an action packed story that is more believable, and therefore more suspenseful, than the common variety 21st Century thriller. 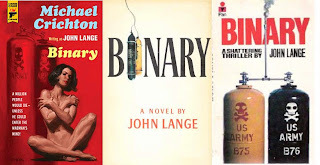 The prose is strong and shifts from a rich and almost poetic cadence to a stark and pounding hardboiled style that is reminiscent of the suspense novels of the 1970s and 80s. 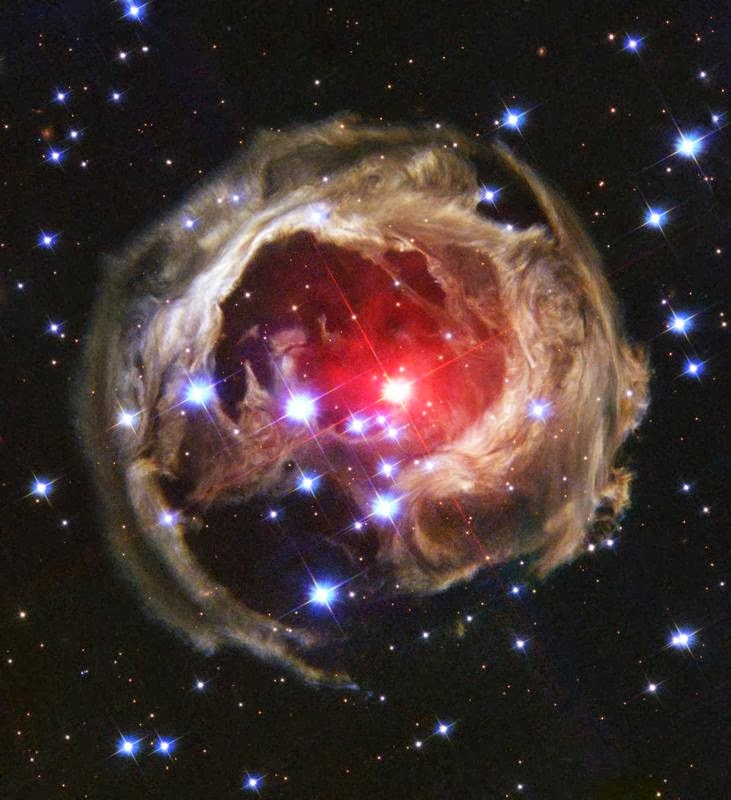 It is, however, not a rehash of anything old or new. The story is original and the style is all Stephen Mertz. 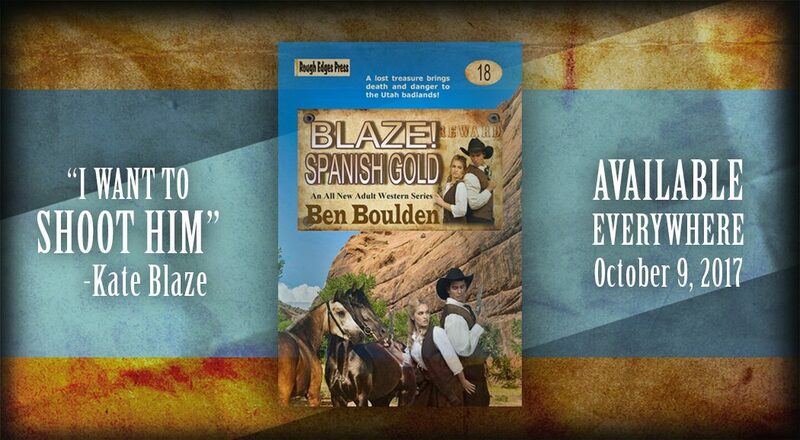 It is a modern adventure novel that it is better than most in its category. The characters, particularly the hero, are built around the story, but they have a certain reality that gives them a flesh and blood feel. They have families, love, hate, hope and even dreams. Their back stories are sprinkled throughout the novel with a sparseness that allows the reader to relate to the characters without slowing the pace of the plot. 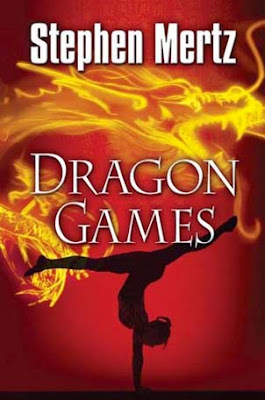 Dragon Games is the best of Stephen Mertz’s novels. The narrative is strong, the characters are vivid and bold, and the story is exotic, enticing, and damn fun. There are brief touches of understated humor mixed with ratcheting tension and action, and richly detailed and interesting descriptions of Beijing, the Olympics and the Chinese people. Mr Mertz has written a novel that is worthy of the first tier of suspense and action novels. 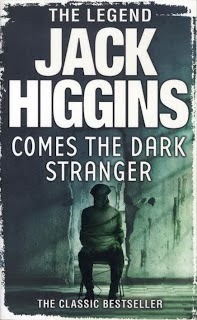 Comes the Dark Stranger is the fourth novel published by Harry Patterson. It was released as a hardcover by John Long in 1962. 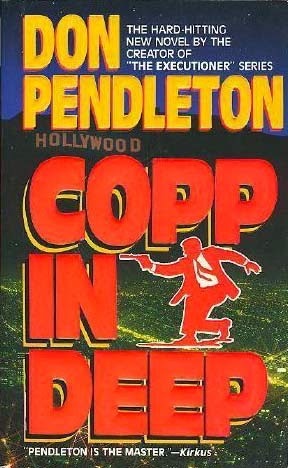 It is an anomaly in Mr Patterson’s body of work because it is less adventure and more noir than anything else he wrote. Martin Shane came to Burnham to kill a man. Eight years earlier he and five other volunteered for Korea in Burnham, and were later captured by the Chinese. They were questioned and tortured by a slight, club-footed Chinese officer named Colonel Li. The men were captive for only a few days, but it was long enough for one of the men to be summarily executed and another to give Colonel Li what he wanted. And Shane came back to Burnham because he needs to know who spilled to Colonel Li, and punish him with his life. Comes a Dark Stranger is an interesting study of cold war paranoia. Martin Shane received a severe head wound in Korea when American bombers raided the monastery where he was held captive, which took his memory for seven long years. The seven years between the last day at the monastery and a few weeks before the story begins are a blank, and the war is fresh on his mind. The cast of characters is straight from a 1950s film noir—a deformed millionaire, a shifty nightclub owner, a sweet but worldly club girl, a drunk and his bitter greedy wife, and the mandatory seemingly honest middle class lady. 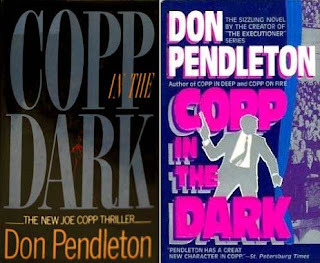 The deep shadows and stark flesh of an urban underbelly is palpable in much of the prose, and as I read the novel I was reminded of the shadowy lighted films popular in the era heavy with paranoia, betrayal, and fear. The paranoia is central to the plot and the throughout the novel Shane hears the scrape and slide sound of Colonel Li walking. It is a sound he hasn’t heard since the Korea, but it is a sound that literally represents the narrow edge between sanity and madness. Comes the Dark Stranger is different than most of Mr Patterson’s novels, and while it seems rushed in spots and a tad over plotted, it is an entertaining diversion. 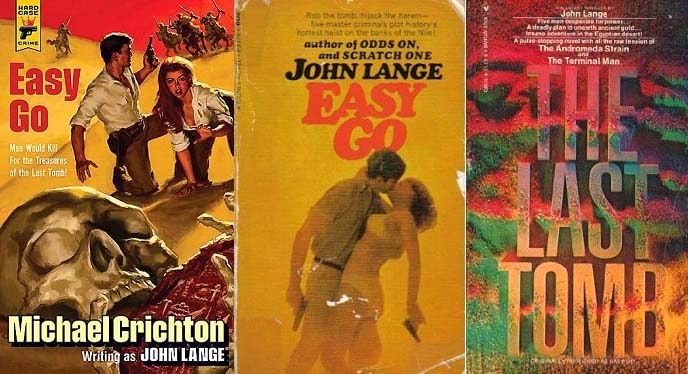 Its atmosphere and tone is rich, and Martin Shane is an engaging protagonist—if seemingly unreliable much of the time—who the reader easily identifies. But the most interesting element of the novel is its experimental nature. Not experimental in the macro sense, but rather in the micro sense—i. e. Mr Patterson’s own body of work. John Grimes is the Owner-Master of the deep space pinnace Little Sister. Little Sister is a modified solid gold hulled ship, which was given to Mr Grimes by his former employer Michelle, Baroness d’Estrang, of El Dorado “in lieu of back pay and separation pay.” A pinnace is a light sailing ship used as a tender for a larger ship, but Little Sister is fully equipped and capable of autonomous galactic space transit. Grimes is on planet for only a few hours when a cargo to the small wealthy planet Boggarty is offered. The cargo is a rush consignment with one hitch: the Superinteding Postmistress Tamara Haverstock must accompany the cargo. The expected pleasantries happens between Grimes and the postmistress until Little Sister’s inertial drive breaks down, and they are boarded by the Shaara, a very advanced bee species. Star Courier is a simple, straight forward space adventure. It is simple, but the sheer amount of action is extraordinary—Grimes moves from budding entrepreneur to casa nova to prisoner to conquering diety. 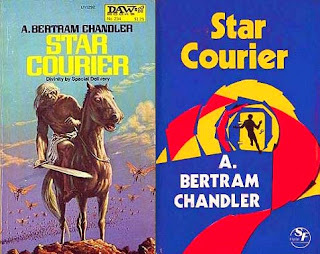 In short, the story is large, but it is played out on the ground and kept not only manageable by Mr Chandler, but also entertaining. The prose is simple, crisp, and very readable. It perfectly matches the story style, and creates a certain low level buzz of tension by pushing the narrative forward quickly and without any overwrought dramatics. 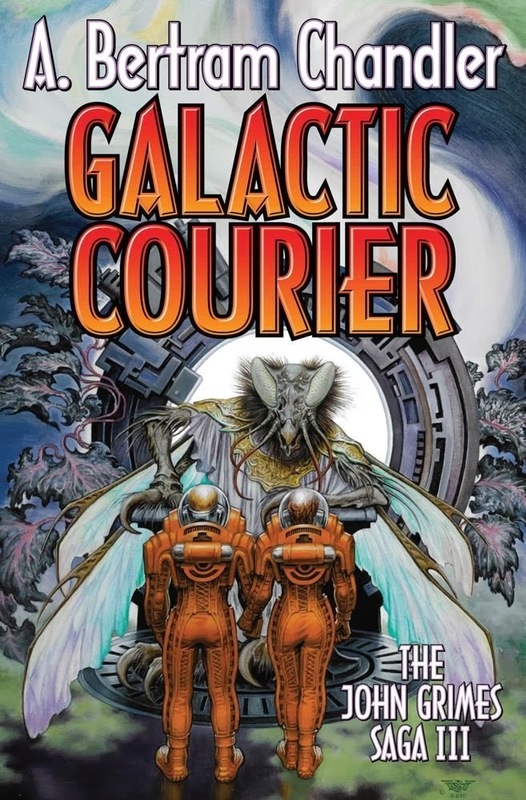 Star Courier is very unlike most of the science fiction currently being published. It is short, full of adventure, and includes very little—no?—philosophy. 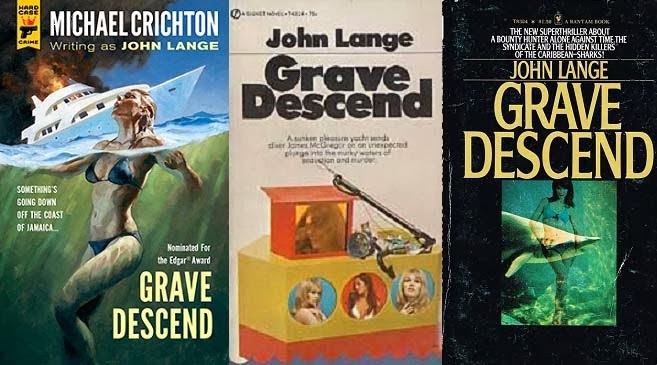 It is something very close to what Ace was publishing in the 1960s and 1970s, and if you enjoy the older science fiction—or maybe it is better described as space adventure—than you will have a great time with this one. 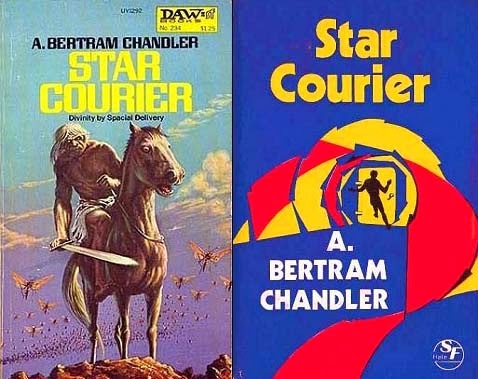 Star Courier felt very much like a sea story; from the use of the term “pinnace” to describe Little Sister, to landing procedures in port, to the use of mainline trading routes. However space travel is inherently comparable with sea travel due to the long distances involved and the solitary self-sustained journeys. 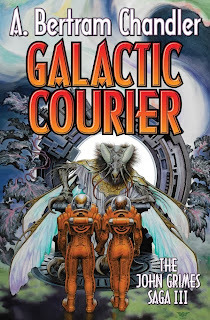 Star Courier was originally published by DAW in 1977, and it is currently available as both an ebook and in an omnibus print edition (both trade and mass market) titled Galactic Courier: The John Grimes Saga III, which also includes To Keep the Ship, Matilda’s Stepchildren, and Star Loot. 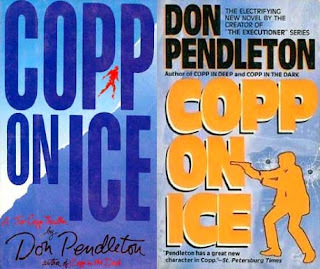 Don Pendleton is best known for his men’s adventure series The Executioner. 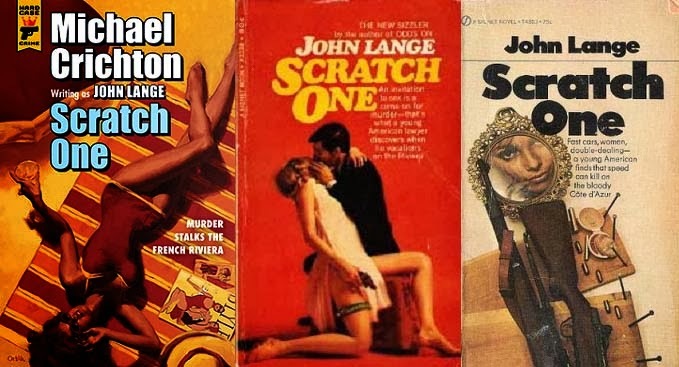 He created it and wrote, more or less, the first 38 titles in the series before he handed it off to Gold Eagle books and a host of ghost writers. 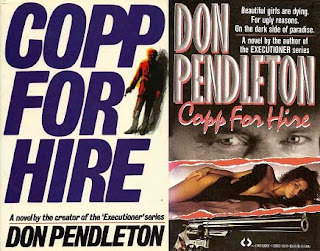 Mr Pendleton’s later work never found the same success as The Executioner, but he wrote a series of private detective novels featuring an ex-cop tough guy named Joe Copp. 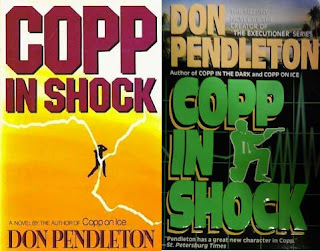 Copp appeared in six novels between 1987 and 1992. They were published in hardcover by Donald I. 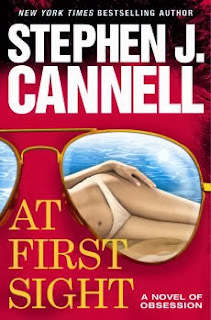 Fine, and paperback (except the first) by Harper. There is something almost juvenile about the stories—black and white themes, hard as nails action, and prose as hard as Mickey Spillane—but the stories are vivid, exciting, and very entertaining. Below is a listing of the books in chronological order with the cover scans of the original hardcover and paperback editions of each title, excepting Copp in Deep, which I was unable to find a scan for the hardcover. Copp for Hire. Published by Donald I. 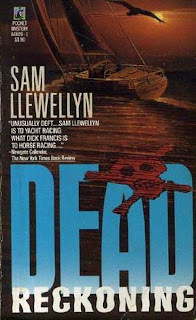 Fine in 1987 as a hardcover, and reprinted in mass market by Lynx Books in 1988. Copp on Fire. 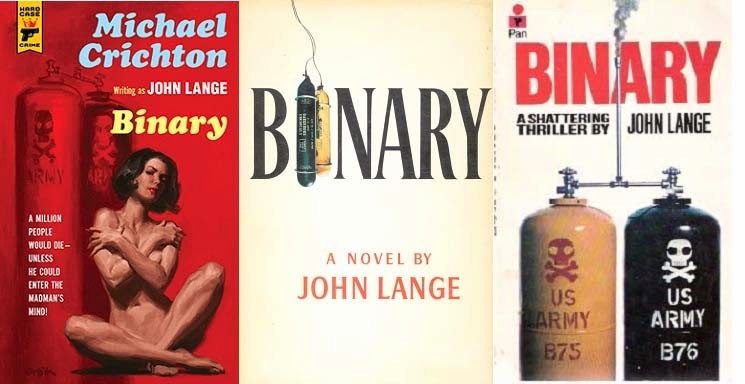 Published by Donald I. 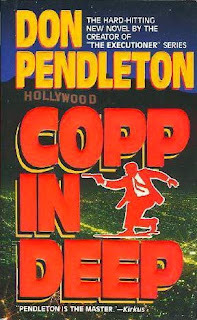 Fine in 1988 as a hardcover, and reprinted in mass market by Harper Paperbacks in 1989. Read the Gravetapping review. Copp in Deep. Published by Donald I. 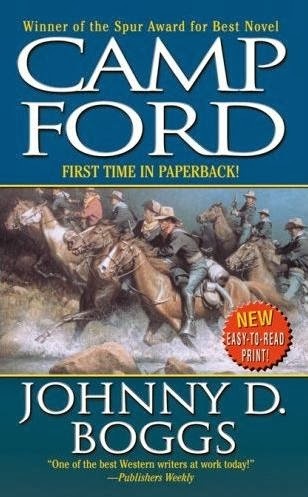 Fine in 1989 as a hardcover, and reprinted in mass market by Harper Paperbacks in 1990. If anyone has a scan of the hardcover I would be much obliged for a copy. Copp in the Dark. Published by Donald I. 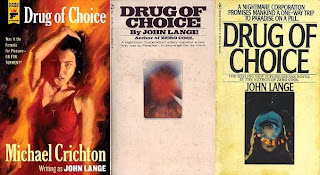 Fine in 1990 as a hardcover, and reprinted in mass market by Harper Paperbacks in 1991. Copp on Ice. Published by Donald I. 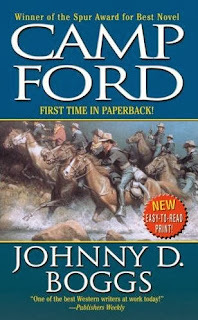 Fine in 1991 as a hardcover, and reprinted in mass market by Harper Paperbacks in 1992. 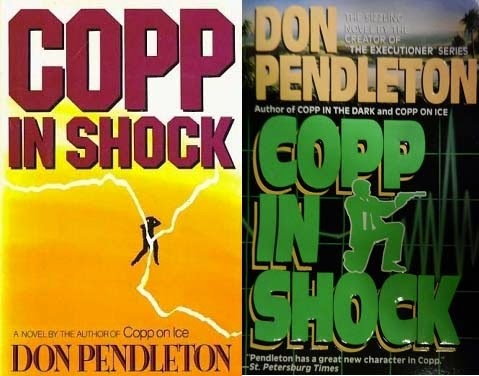 Copp in Shock. Published by Donald I. 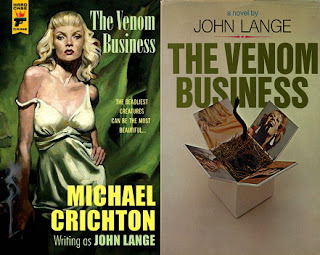 Fine in 1992 as a hardcover, and reprinted in mass market by Harper Paperbacks in 1993. 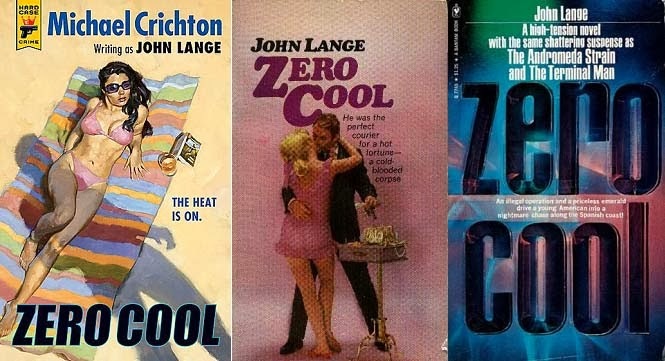 Stephen Mertz is an unheralded, and much undervalued, writer of action and suspense novels. He has steadily put together an impressive body of work since the late 1970s. He was one of the original writers of the post-Don Pendleton, The Executioner series, and he created a few of his own successful men’s adventure series in the 1980s, including M. I. A. Hunter and Cody’s War. But the meat of his work is what he has produced over the last decade starting with Night Wind, and including the excellent novels The Korean Intercept, Dragon Games, and Hank & Muddy. 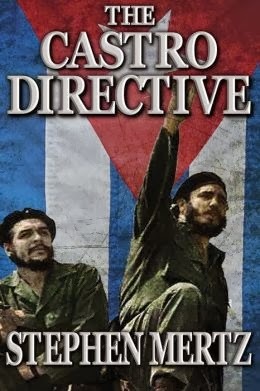 I read his most recent novel The Castro Directive in close to a single sitting. 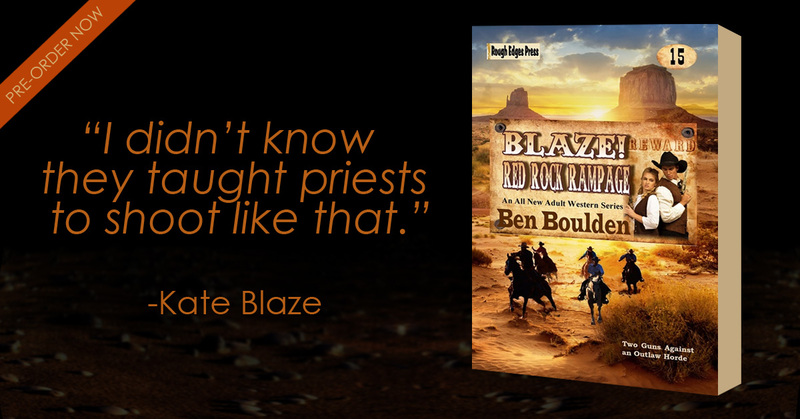 It is a straight action thriller with a dollop of intrigue, and a touch of betrayal. The year is 1961. The CIA sponsored Bay of Pigs invasion of Cuba is in its final phase and a high level leak is passing information about the invasion to the Castro government. When a CIA man is killed on a deserted Cuban beach the Kennedy administration brings in a troubleshooter named Michael “Graveyard” Morgan. Graveyard is a Green Beret sergeant stationed in Vietnam as an advisor, and he is a man who gets the job done. Morgan’s job is to find the mole. It takes him from the streets of Miami to Nicaragua to Cuba, and back again. There is an interesting sub plot involving Graveyard’s daughter and wife, and the cast of characters includes President Kennedy. The JFK described is long on intelligence, but short on marital fidelity. One of my favorite presidential scenes has Kennedy reading a James Bond novel poolside. Graveyard is an action hero from the old school. He is tough, single minded, and willing to do, and risk, anything to get the job done. The added element of his family, which Mr Mertz ties into the story admirably, adds a little meat to the bone and makes the story more interesting. 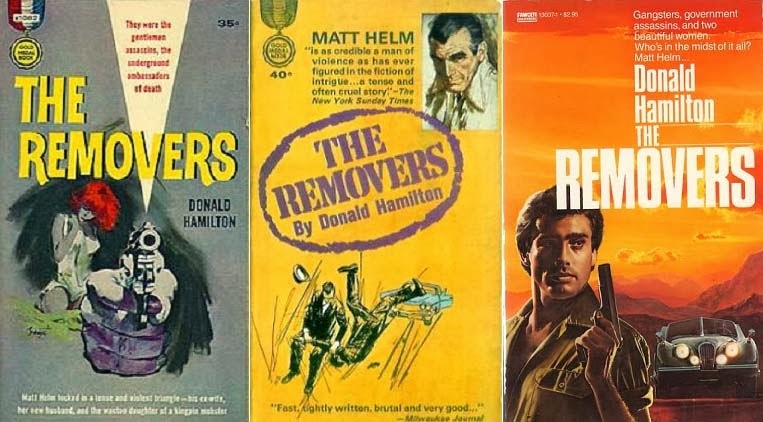 The real charm of The Castro Directive is the setting—1960’s South Florida, especially—and the straight forward action, which is a specialty of Mr Mertz. The Castro Directive may be Stephen Mertz’s best novel to date—and each is seemingly better than the last—but even if it isn’t his best, it is damn enjoyable anyway.